Do you love the look of natural stone or slate but want to be creative with color? Stamped concrete could be the perfect solution for your outdoor living space, walkways, patio, driveway or pool area. Decorative stamped concrete provides you with limitless design possibilities – from colors to patterns. 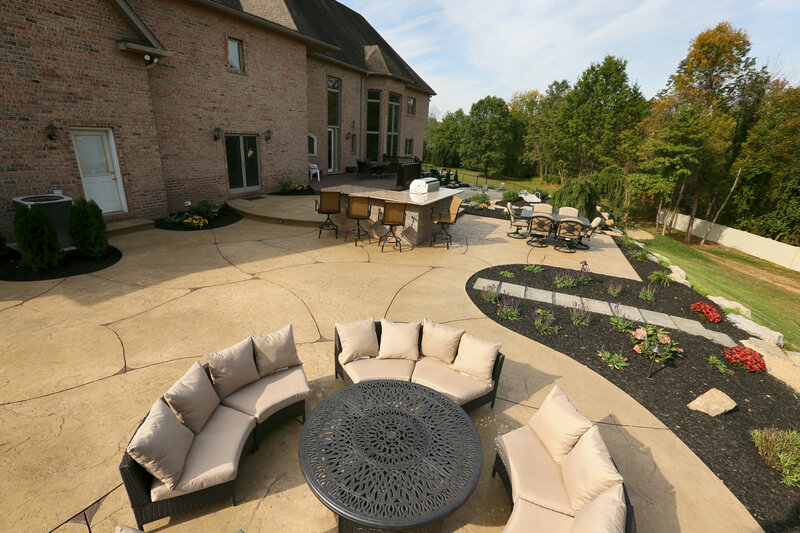 When you combine its greater durability and lower cost than natural stone products, stamped concrete is an easy low maintenance choice for both new construction outdoor areas and renovation projects. Decorative concrete is also an excellent choice for indoor floors that experience heavy traffic. The color choices available include a mix of earth tones that go well with most exterior and interior settings. You can have a color mixed in with the concrete (an integral color). Integrating the color into the mixed concrete gives the entire batch of concrete an even, consistent color throughout your project. The second option is to have a color hardener hand-broadcasted and troweled into your concrete’s surface. This color hardener will increase the concrete’s surface hardness from 3,500 psi to 6,000 psi – and it is abrasion resistant. At Signature Concrete Design, we use both of these methods in all of our projects – giving you every advantage possible. We then add a release agent during the stamping project that will give you a third color. This third color step creates a color variation unlike any other. This unique coloration process creates exceptional color variation which closely mimics natural stone. The decorative design is stamped into your desired look after the concrete has been poured and the color incorporated – but before your concrete sets. You have many pattern choices including brick, cobblestone, tile and slate. There are also a wide variety of design patterns from large and small slate patterns to seamless textures. These patterns, along with your color choices will give you your own personal “look”. Once the project has set, Signature Concrete Design seals the surface to protect it from dirt and stains. The sealer improves the overall strength of the surface and – with an anti-slip additive – ensures that your stamped concrete is safe. A popular addition you may want to consider is a snow & ice melting system incorporated under your stamped concrete installations. Just by turning on the snow melt system, you no longer need to salt, shovel or chip ice from your pathways or driveway. A system can be as small or as large as you like. Winter just became much more fun! Stamped concrete requires sealing to protect against the damaging effects of traffic, weather, and de-icing salts. We use professional grade 100% pure acrylic VOC compliant concrete sealer with a clear, non-yellowing film that is more durable than the standard polymer blend cure and seal products. A properly sealed concrete patio is a two-day process. We power wash your patio to properly prepare the surface and then apply the sealer. If your colors have faded, we can also add color before applying the sealer. Stamped concrete is a process where color and texture is added to normal concrete. The concrete is poured and a stamp is pressed into the surface, leaving a design and texture after the concrete sets. The end result is a beautiful product that has the natural look of brick, slate, stone or tile. Does stamped concrete look fake? Absolutely not. Even experienced concrete masons have been fooled by the authentic look of stamped concrete. Come see for yourself. Stop by our Easton showroom. How do you add color to stamped concrete? Color is spread onto the surface of the poured concrete by hand. The color is then worked into the surface using hand tools. We are also able to mix an integral color in a ready mix concrete truck to give the entire poured concrete area one single color. How long has stamped concrete been around? 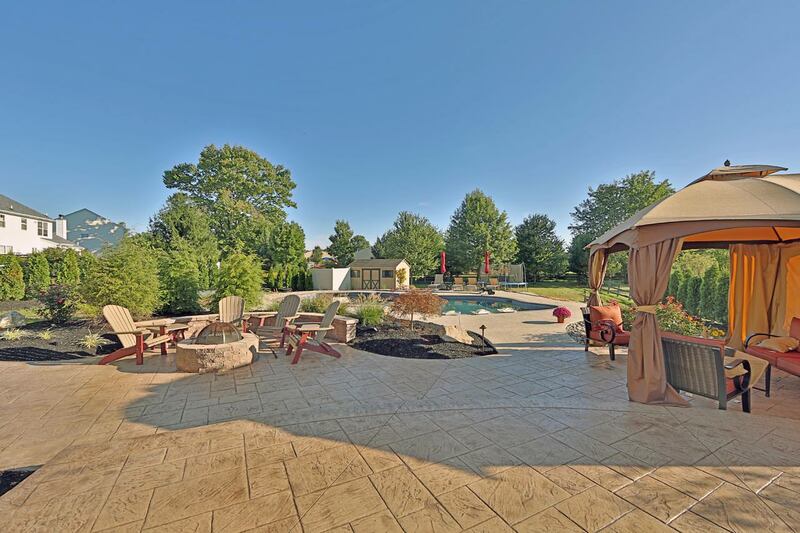 You might be surprised to learn that stamped concrete has been used for almost 50 years in a variety of applications. 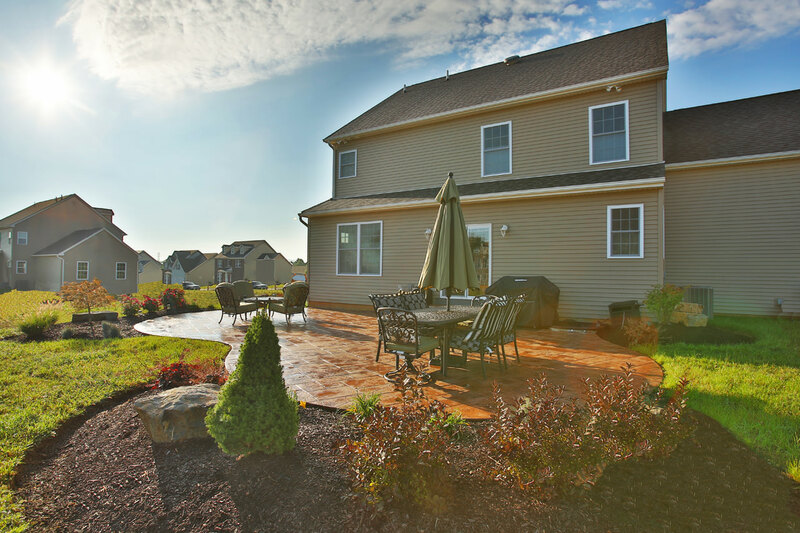 What’s different about today’s stamped concrete versus that of the past? Today’s stamped concrete achieves a level of realism that greatly surpasses past designs. 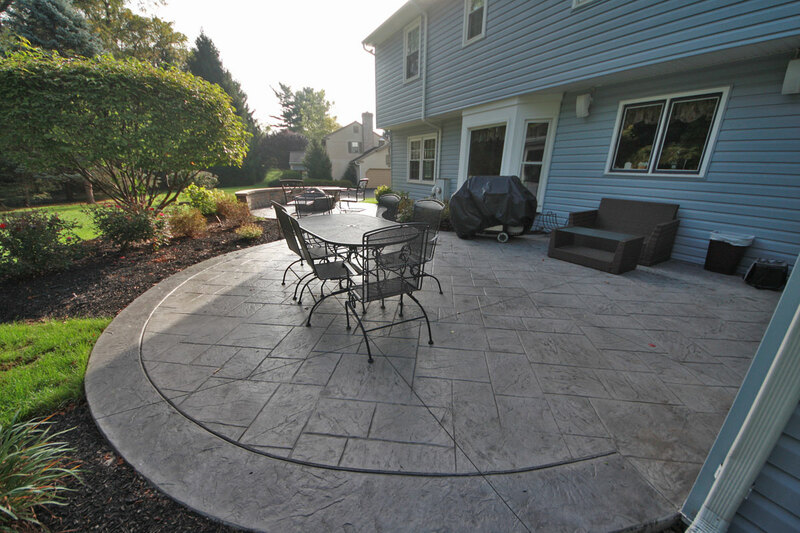 Years ago, stamped concrete was capable only of simulating a pattern. It lacked definition and resolution. 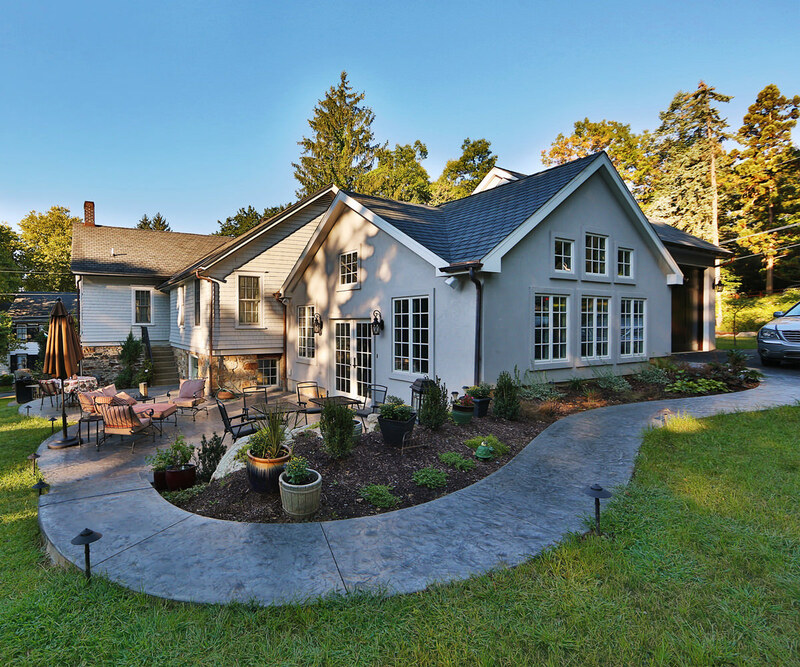 Through moderntechnological advances, stamped concrete has shed its standardized patterned look and is now virtually indistinguishable from real brick, cobblestone, slate and tile. Can stamped concrete be found in commercial environment? Absolutely! Decorative concrete can be found throughout the world at many distinguished hotels, casinos, and resorts. If you’ve been to Disney World, you’ve experienced stamped concrete at work. 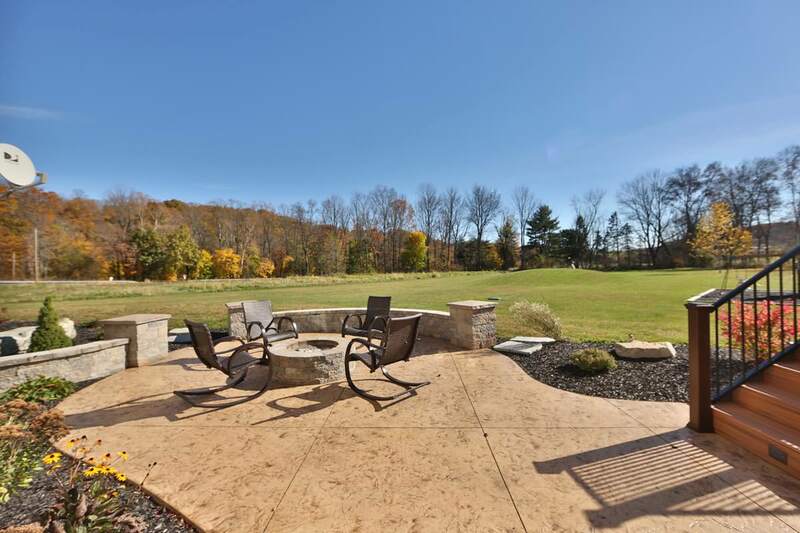 Is stamped concrete better than other products, such as wooden decks or interlocking pavers? Low maintenance stamped concrete could be a better choice for you than a wooden deck or pavers. It depends on your lifestyle. For instance, wooden decks are very maintenance-intensive and many people find this to be highly objectionable. As for interlocking pavers, the settling of pavers over time and growth of weeds through the seams are two characteristics that have always given people cause for concern. Interlocking pavers, which incidentally are manufactured out of colored concrete, have the inherent flaw of dramatically settling in only a few years’ time. The result is a wavy appearance that some people dislike while others do not. Is stamped concrete slippery when wet? It can be – and as a level of precaution, Signature Concrete Design applies an anti-skid surface to each and every stamped concrete installation. This anti-skid additive does not alter the beauty of the finished product and is highly-effective at eliminating slipperiness. How well does stamped concrete perform in the winter? Even the coldest, snowiest winters do not pose a problem for decorative concrete. In fact, our neighbor to the north, Canada, is home to a significant percentage of the world’s largest stamped concrete installations. Is there any chance that my stamped concrete project might crack? Cracking issues are perhaps more likely with regular concrete. Stamped concrete achieves a level of crack prevention exceeding almost all other concrete products in the industry. At Signature Concrete Design, we takenumerous measures to significantly reduce the likelihood of any cracks occurring. We use both wiremesh steel reinforcement and polypropylene fibermesh reinforcement in 100% of all our stamped concrete installations. These and other measures significantly lower the probability of cracks occurring. What kind of maintenance is necessary for stamped concrete? There are two different maintenance paths for stamped concrete. No maintenance: You can choose to do no maintenance at all. Nothing is required to keep the concrete’s strength intact. If you choose to not to seal your stamped concrete, you will enjoy a natural aging process in your colors. Periodic sealing: Stamped concrete has the ability to re-capture that “brand new” look after a re-sealing. In our experience, stamped concrete looks even better after a reseal than when originally installed. 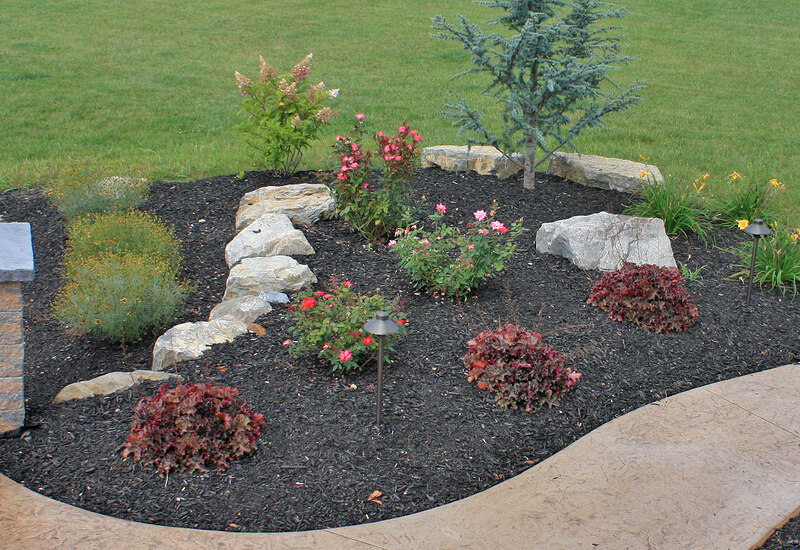 We do recommend that you reseal your decorative concrete once every two to three years to reinvigorate the color. A resealing may even surpass the look of your original installation. 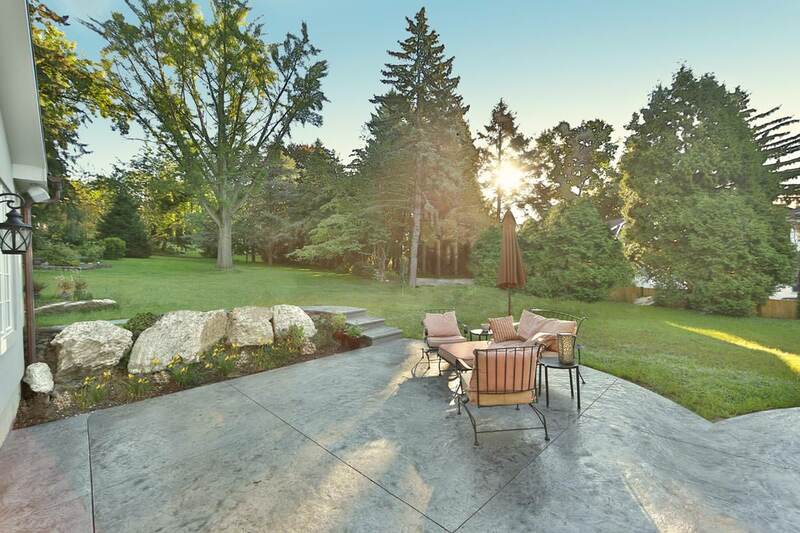 How much does a stamped concrete project cost? Surprisingly, decorative concrete often costs less than interlocking pavers, and may cost considerably less than wooden decks. Final estimates will vary depending on job conditions, the nature of work to be completed, and more. Talk to us about your project. How much does it cost to reseal my stamped concrete project? The cost of resealing depends on the current condition of your concrete. For example, if the surface is a cracked concrete patio with highly faded areas, it will cost more than a patio that simply needs a new coat of sealer. We accept payment via cash or personal check. Stop In To See What Your Stamped Concrete Project Could Be. 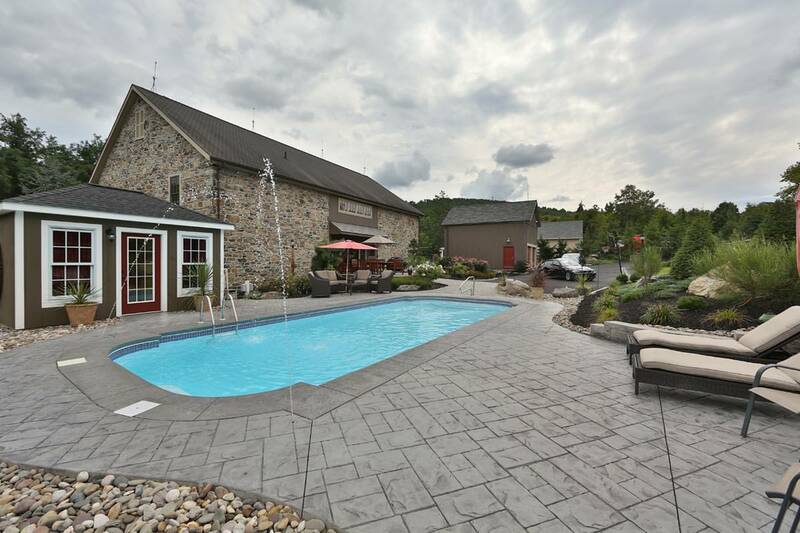 Visit our Easton showroom to view samples of stamped concrete and talk with our outdoor living designer.